Welcome to a special Blog Hop featuring projects from Our Daily Bread Designs and The Flower Soft Design Teams! As you make your way through the hop, make sure you leave a comment on each blog post. There will be two random prize winners chosen from comments left on the designers blogs. Flower Soft and Our Daily Bread Designs will each be selecting a winner for a $20 prize package! The blog hop ends on August 30th, prize winners will be announced on both The Flower Soft Blog and Our Daily Bread Designs Blog on August 31st. If you arrived here from Debbie Seyer's Blog, you are in the right spot, if not you can head back to the Our Daily Bread Designs Blog to make sure you didn't miss anyone. I created a Christmas card using Flower Soft's Christmas Snow Globes 3D Cut Outs, Polar White Flower Soft, Display Globes, Oval Aperture Cards and ODBD Peace and Joy and Worship the Lord sets. Using the Flower Soft Glue, I added Polar White Flower soft to the snowy areas. To secure the globe in place, I used Scor-Tape. I added some Silver Gems to embellish the stamped snowflakes. Thanks so much for stopping by, don't forget to leave comments on all the designers blogs for a chance to win prizes from Our Daily Bread Designs and Flower Soft, your next stop on the hop is Gini Gagle's Blog. wow, wow, wow. the dimentions your card has is great. this card is stunning. the colors you chose and the use of flowersoft just added to it's beauty. Lisa, this is the most beautiful Christmas card ever! Your dimension and layers are remarkable. Flower Soft just makes your card leap. Gorgeous, wonderful work. Oh my! Beautiful snowy scene! Love the depth of the image and the effect of the globe. Oh WOW this is amazing, I love it!! Perfect for this challenge and how well it fits with ODBD stamps. Oh this is beautiful Lisa! LOVE that Polor White FS!!! Great winter scene in the globe! So beautiful! The Polar White is one of my favorites! Oh my word how detailed and stunning is this. I love it. You did so much work on this card, but it really shows. the winter-village almost seems to pop out of the card! This is a stunning card! I love it. Thanks so much for making it and sharing it with us. Stunning Card! Love it love it. I love the sentiment and the 3D effect is just amazing. Love the snow you did with the flower soft. And the thought of a globe wow. I remember as a kid the snow glob. This is amazing. Beautiful! I have some of those cards and domes but have never used them - I might now! Awesome card, love the layered church and your snowy trees, the globe effect is a reminder of all the snow globes my daughter collected growing up. Beautiful work. What a beautiful Christmas card! Gorgeous! This is a beautiful card. I am a new follower. TFS. Awesome Card! Just look at all the Detail and Texture is F A B U L O U S! Wow! what an amazing Christmas card. Flower soft is a really neat product. It is the first time I have seen it. Feel like I need a cup of hot chocolate as I view this....so lovely! Great idea using the globe and love the sentiment. This is so COOL! Wish Christmas was here to be cool too. This is so unique. Love the flower soft used like this. This Christmas card is sooo beautiful! I love it! The colors, the scripture...and especially, the globe feature. Simply beautiful!! Great job! Your snow scene comes alive and adds depth with the Flower Soft. Great job! Lisa your snow scene is absolutely gorgeous!!!! Wow, it's 118 here today and your snow scene is just what I needed. It looks so nice and Cold! Love it. Wow! This is absolutely beautiful & a wonderful keepsake. What a beautiful northern hemisphere card. Love it. I live in Australia and our christmases are always hot, so I love the cool look of your card. Thanks for posting. Lisa, this is absolutely stunning! Beautiful design and detailing! Love this look and design! Wow, this turned out wonderful! Gotta love that little snow scene! Lisa this is just gorgeous. Love your snow. Wow, Lisa your card is awesome!! Don't the flower soft adds the perfect touch for snow!! I love it!!! Just love this blog hop, such wonderful ideas!! How lovely ... that snowy country church scene looks so inviting, especially as it's so hot and humid here today! I would frame this card so that I could look at it year around. Your scripture verse goes so beautifully with your sweet little church, too. Thank you for sharing with us. FABULOUS card, LOVE how you used the flower soft for snow !!! Very creative !!! Beautiful, Lisa! What a great winter scene! Makes me long for snow! This card is AMAZING--I love the way you used flowersoft as snow---I will have to try this idea---thanks for sharing. Wowee, wow, wow!!! I want to learn to do that! Every element of this card is perfect! Inspired and inspiring! 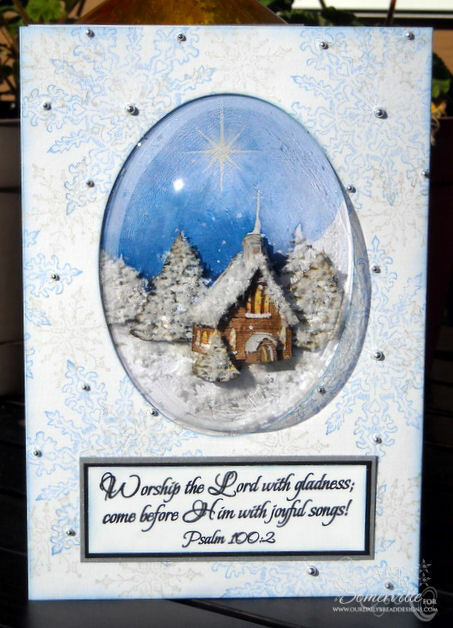 LUV the beautiful and refreshing frosty scene ... especially combined with a wonderful Psalms scripture! Makes me smile inside & out! Wow...all the detail and beauty in your card...lovely! What a pretty snowy scene! I especially like the Scripture you included. Thank you. What a lovely card! I printed this off for future reference. That is insanely stunning and detailed! Beautiful! WOW!!!! that is simply gorgeous!!! !I just love everything about it!! Very pretty card! I haven't tried to make one that technical yet - it looks beautiful. Beautiful card. Love the 3-D effect. Oh Lisa! This is just stunning. Perfect application for white flowersoft, makes the perfect snow globe. Awesome job, TFS! Gorgeous card, reminds me of winter where I live, lol. Blue and silver of are one of my favorite color combos...that snowy background is great. Wow, that's awesome. I love the snow look. I'm still amazed at what you did with the globe! Awesome! This is the most amazing Christmas card I have seen yet! 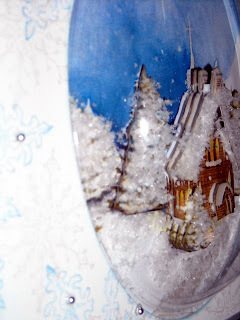 I wanted to make a stamped snow globe with a village scene in it...this is so close...I only pictured it to be flat! I just wonder how difficult it is to adhere the globe? Is there a sheet of cs behine this part...that holds it firmly in place? I love everything about this...especially the beautiful Scripture and the polar white Flower Soft. I wonder if I could pull this off?